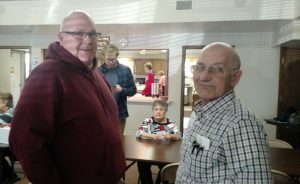 We are a mix of people who grew up in Barneveld and folks who have recently come to the area. Some of us own businesses or farm locally, others commute to Madison, Dodgeville, Mt. Horeb or elsewhere. We are farmers, merchants, students, teachers, office workers, professionals, and retired people. Although we have a mix of political views, most of us tend to stick to the middle of the road. We live and let live. We are religiously diverse. For the most part, we take the Bible seriously but not literally, although there are a few Biblical literalists among us. We have come from a variety of backgrounds—United Church of Christ, Congregational, Catholic, Lutheran, Methodist, and more. Despite our differences, we are united by our love for God, our eagerness to serve the community, and our ability to care for each other. We know that if you decide to join us, we can and will make a space for you.